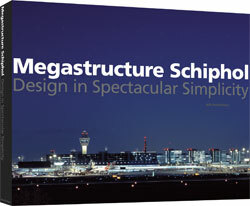 The book Megastructure Schiphol: Design in Spectacular Simplicity (nai010 publishers) is the result of a long-term research project on Schiphol Airport at VU University’s CLUE institute, led by VAMA teacher Koos Bosma. On September 23, the volume will be launched (with lectures and conversations) at Pakhuis Willem de Zwijger (Piet Heinkade 181c, Amsterdam) from 1 til 5 P.M. The book comes in an English as well as a Dutch edition, but the event looks to be in Dutch. On the very next day, September 24, the book Paris-Amsterdam Underground (AUP) will be launched with a roundtable discussion that brings together a range of experts in art, history, film and media to debate the place of counter-culture in Paris and Amsterdam from the 1960s to the present. VAMA’s Ginette Verstraete is one of the authors and will take part in the discussion, which takes place from 5 til 7 P.M. at Spui 25 (which is located, as you may have guessed at Spui no. 25 in Amsterdam).